As the bathtub is usually the main feature in your bathroom, it is important to ensure you are choosing the right style as there are a multitude of styles, colours, and finishes to choose from. We have selected 3 types of bathtub that are sure to suit any space and by following our hints and tips, finding the ideal style can be just as relaxing as a long soak. Deeper than the average bathtub, soaking tubs are designed with ultimate luxury and relaxation in mind. 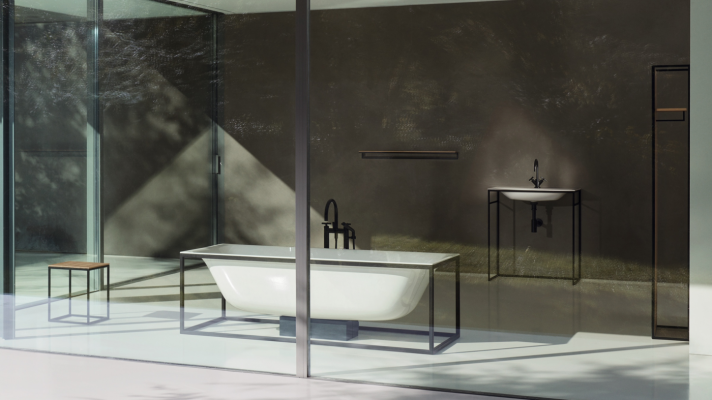 Enabling the bather to immerse the whole body in the water for a spa-at-home experience, these tubs create a simple but stunning centrepiece while bringing an air of zen to the home. This stunning, minimal design from Bette is ideal for a modern interior. The black framework and taps add a sophisticated timeless edge while emphasising the simplicity of the space, these are also echoed in the sink and furniture designs to create cohesion. The bathtub doesn’t always have to take precedent in the room, it can be cleverly styled and positioned to act as more of a design element than a centrepiece as most freestanding tubs would be. Deciding on the position of the bath in relation to the other features in the bathroom is key, especially if working with a larger room. Built-in baths will usually be placed with the length of the bath against a wall but positioning the head of the bath against the wall creates interest and divides the space. 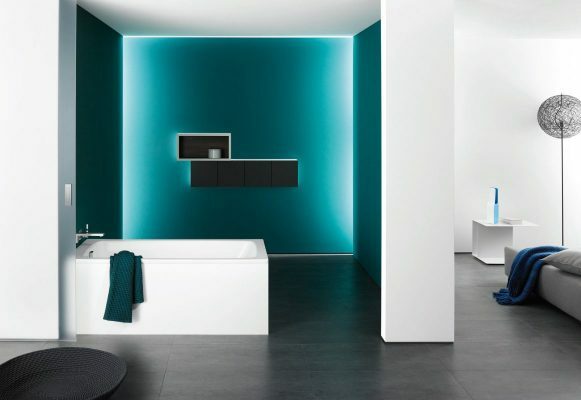 With the stand out turquoise colour behind it, this wall-mounted Kaldewei bathtub shows the simplicity of a ‘general purpose’ bathtub in a stunning setting of a dark, rich coloured wall. 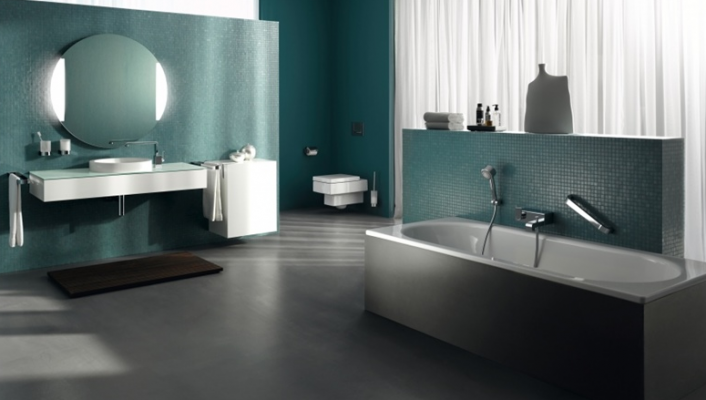 Although the majority of bathtubs are acrylic, there are many finishes to choose from with textures to suit any space. Create a natural feel with stone, a traditional look with metal or a modernist mood with sleek porcelain. One point to consider when selecting the finish is the weight of the bathtub itself, metal tubs can be very heavy and require flooring to be reinforced prior to installation, especially if the bathroom is above ground floor level. Keuco has created a bathtub with a difference using chrome panelling to enhance the chic, minimal styling of this teal tiled bathroom. Eye-catching without being overpowering, sleek finishes are an excellent way to create a sense of luxury in bathrooms of any size. Now you should be ready to escape the world and indulge in some serious rest and relaxation in the bathtub of your dreams – bubbles are optional but highly recommended! Take a look at our previous blog where we discuss our Top 5 Bathroom Trends You Need Right Now to find further inspiration for your bathroom. To view these brands, our other bathtub ranges and receive advice on styles, bathroom design and installation, please visit our showrooms or give us a call. This entry was posted in Baths, Style and tagged Bathrooms, Baths, Bathtubs, style, The Bathroom Company.